IBM and Citibank announced yesterday that Watson will be working as a banker. Even after reading the IBM news release or the Bloomberg story, you'll only have the haziest idea of what work the computer will be doing. That, I would imagine, is because nobody really knows. It's like a football team that hires a fleet-footed seven-foot-tall 350-pound athlete from Ukraine or Zimbabwe. He might not know how to play football yet, but he has talent. And by experimenting, there's a good chance they'll find a position for him. One thing to keep in mind is that a Watson-branded technology is likely to be very different from the machine that triumphed in Jeopardy a year ago. The Jeopardy system was a rich combination of technologies, including natural language and datamining, along with multiple flavors of machine-learning, and advanced analytics. When developing AI systems for work in hospitals or banks, IBM can mix and match pieces of Watson with other available technologies, including the analytic systems already in place in those industries. I wouldn't be surprised to see a "Watson" system that greets visitors to Citibank and lines them up with the right department or perhaps reviews people's investments, and signals areas of high risk. This wouldn't match the sophistication of the Jeopardy system. But it would extend the Watson brand, which is clearly one of IBM's goals. 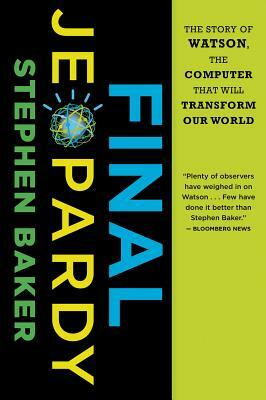 At the same time, far from the public view, the research side of Watson could be "reading" vast libraries of financial documents, correlating its "learnings" with market data, and guiding investment strategy. For Watson to pay dividends in such higher-level jobs will require training, which is what Citibank and IBM will no doubt be providing. Meanwhile, another version of Watson could be reviewing bank documents and communications, searching for indications of insider trading, and policing corporate governance. The point is that a system with a combination of natural language, datamining and analytics will find plenty of work in today's data economy. Some of the early efforts will be targeted more toward branding. But in time, Watson-like programs will redefine the work many of us do. And IBM won't be the only company creating such technology. Update: Here's an IBM blog post that provides more scenarios of what a banking Watson might be up to. The paperback of Final Jeopardy is coming out March 27. You can pre-order on Amazon or B&N or Indiebound. A couple of advance copies arrived here the other day. I like the look, the feel, the cover, even the new sub-title: The Story of Watson, the Computer that will Transform our World. The previous sub-title: Man vs Machine and the Quest to Know Everything. Why the change? It seemed when we were first marketing the book that readers would be interested in the man-machine match. Watson back then was a virtual unknown. Now the match is over. We all know who won. What's more, the winner is famous. So the book is not only about technology, but also a celebrity bio. When machines like Watson start showing up in marketing departments, which jobs will they handle? More specifically, which pieces of work will they handle, and transform? I'll be speaking about this on March 5, at Brite '12, a conference at Columbia University on brands, technology and innovation. I haven't figured out exactly what I'll say, but the focus will be on language. If marketers with no programming or data-mining know-how can ask the machine in natural language to look for something, that Watson-like machine, using its language skills, will be able to scour not only traditional data, but also thousands of written analyses. Then, using a combination of its language smarts and marketing analytics, it should be able to come back with a list of suggestions, or hypotheses, about marketing campaigns that might work. We were down in Ft. Myers/Sanibel Island over a long weekend. In Ft. Myers, we went to Six Mile Slough (pronounced "slew"). It was a beautiful walk. My only complaint (a constant for me in modern life, and especially in Florida) is that the nearby traffic was loud. We walked on a boardwalk through wetlands, saw birds, a small alligator, and lots of beautiful reflections in the shallow mangrove pools. It struck me, looking at the photos, that through the years I've turned things around. I used to look at abstract art and try to see what they were representing. Now I find myself looking at the world and trying to find the abstractions. Does that happen to you? In Sanibel, we went to Ding Darling Wildlife Refuge. Don't miss it if you're down there, and try to go near dawn and/or sunset. Last winter it snowed every week. And I remember tossing and turning in bed, worrying whether a storm might cause me to me the match between IBM's Jeopardy machine, Watson, and its human foes, Ken Jennings and Brad Rutter. If I missed the match, which took place a year ago this week, my book project would be highly compromised. I was full of worries. There was the very real concern that Jeopardy executives, fearful that the results of the match might leak before it came out on TV a month later, would block me out. That possibility, it turned out, was very real, IBM sources told me later. Big Blue had to lean on Jeopardy to get me a seat at the performance, held at IBM Research in Yorktown Heights, NY. If it had been held at the Jeopardy studio, in Culver City, Calif., as originally plan, I have little doubt that I would have been blocked. As far as the Jeopardy team was concerned, I represented risk. If I missed the show, the book would have been a mess. I had written 9/10 of Final Jeopardy, and it had gone through the editing process. But the last chapter hinged on the match. It was to take place on a Friday. I was to write the last chapter over the following two days and submit a draft on Monday. That would be edited and added to the book. A couple of weeks later, the public would be able to buy the partial ebook--everything except for the last chapter--online, and then would be sent the last chapter when the physical book came out, the day after the televised match. It was tight scheduling. For it to work, I had to get into the show. My other fear was that Watson would lose. The machine lost about 30% of its matches against tournament of champion competitors in its last series of sparring matches. I had seen its vulnerabilities. Despite its strengths, entire categories could confound Watson. What's more, Jennings and Rutter were the best players on earth. Following the match, I've read lots of opinions on social media that IBM had fixed the match, and wouldn't have played it if there was a chance that Watson could lose. This is not true. And if Watson lost, my book would be the story of a machine that failed. Hardly a selling point. I drove up to Yorktown from my home in NJ and didn't relax until I had gotten through security and was inside IBM Research. By that point, I figured that even if Jeopardy kept me out of the studio, I could watch on TV monitors in the overflow room. I wasn't particular. But I was concerned about capturing the data. I had a digital recorder, and for backup, I'd downloaded a recording app on my iPad. I would have to recreate the match, with the precise clues and scoring at each juncture, from the audio. Much of the rest of that day I included in the final chapter: A wound up David Ferrucci, Watson's chief developer, crying as the make-up woman worked on his face; IBM CEO Sam Palmisano, as Watson steamrolled the humans, telling one of the researchers, "Maybe we should have toned it down a notch:" Jeopardy host Alex Trebek gamely entertaining the restive crowd with his stand-up routine during the seemingly endless technical glitches; an exhausted Jennings and Rutter, standing in a lonely hallway, waiting to do more video interviews after losing the marathon match, this while the happy IBM crowd was upstairs drinking cocktails and toasting the victor. Here are Jennings' memories. As I drove home 52 weeks ago, I leaned out of the window and took one last picture of IBM Research on a winter night. This book is more an hors d’oeuvre than a gourmet banquet. But it serves a tasty slice of the larger themes addressed by What Technology Wants and In the Plex. Sometimes the technology simply says, “What the heck.” Sometimes the seemingly trivial provokes serendipitous and significant leaps of innovation. A month ago, I sat down with two members of IBM's Jeopardy team, Eddie Epstein and Jennifer Chu-Carroll, and with Katharine Frase, a VP at IBM Research, to talk about Watson's next jobs or, more broadly, how the next generation of computing will spread into the economy. This session was taped and will be shown at the High Performance Computing Virtual Event on Sept. 14. Here's the link. The video goes for about 45 minutes. Then we'll all be on phones for a Q&A to follow. I cannot promise this, but I've heard that at least several hundred copies of Final Jeopardy will be given away to attendees. What does Watson know about birds? 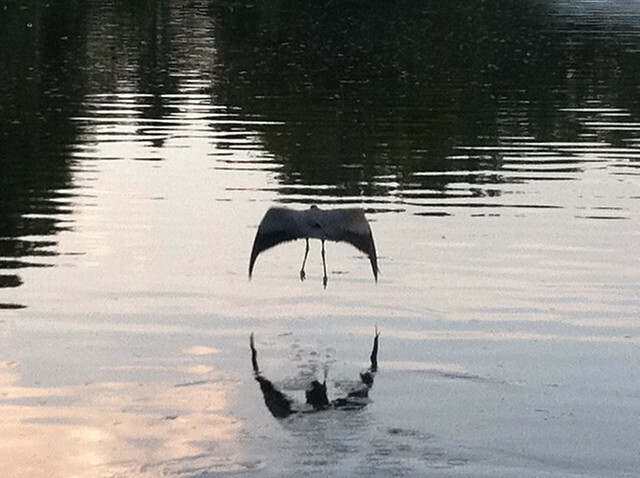 I happened to see this heron in a Montclair pond a week ago, and it led me to wonder what my old friend Watson would make of that lovely water bird. Specifically, if Watson's analysis indicates that a heron is a bird and it also has strong evidence that birds fly, would Watson be able to infer that a heron would fly? The answer to that is no. The reason is that Watson, for all of its achievements in Jeopardy, is incapable of generalizing, much less coming up with theories. Humans do this all the time. You see toddlers who mess up their irregular verbs, saying that Johnny "falled" or that Timmy "eated." They're creating a theory of language based on the patterns they've picked up. And when toddlers see that robins and bluebirds and cardinals fly, they quickly generalize about birds. That's a key aspect of human intelligence, and Watson doesn't have it. 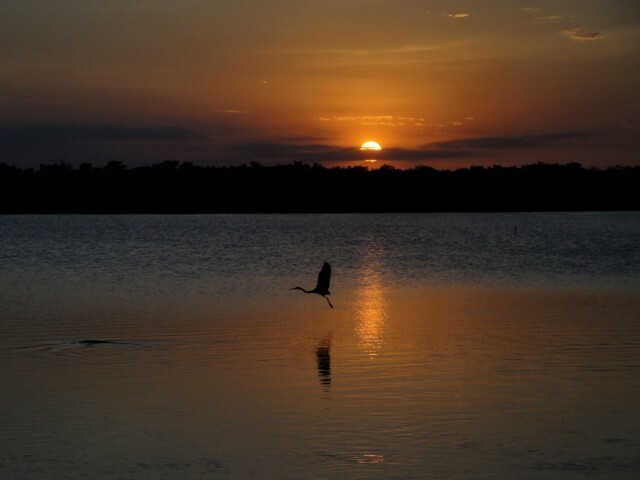 Watson could find many references to herons, both as birds and flying animals, and it could correctly answer a question about what herons do with their wings. But that conclusion doesn't inform any broader thinking on the subject. That's not what it's built for. So, as we look to the job market, humans who make a living by synthesizing information and coming up with theories are not likely to be displaced by computers anytime soon. Those who comb through data to find answers, by contrast, will be facing increasingly stiff (and tireless) competition. To be fair to Watson, I should add that its inability to generalize sometimes pays dividends. This is because generalizations usually have exceptions. If we come up with a theory that birds fly, penguins and ostriches can confound us. Watson, by contrast, would come across very little evidence of flying ostriches or penguins and--unburdened by theory--would sidestep that trap. It's odd that I'm writing here about flying, because that's the very metaphor that occurs to me. Our minds soar--and sometimes we lose sight of the reality on the ground. Watson never leaves the ground. It sifts ceaselessly, analyzing and crunches. Never distracted by ego, desire, theory, or hundreds of other human qualities, it just churns out the statistically most likely answers. In the cognitive realm, Watson's our beast of burden. Anyway, one issue that came up at nearly every stop: If Watson had a faster finger on the buzzer, was it a "level playing ground?" My feeling is that when you put people into competition with machines, no such field is possible. Each side has different strengths. Yes, Watson was faster than the humans on the buzz. If Watson had confidence in a response, it pressed the button within 10 milliseconds. To beat that, humans had to anticipate the activation of the light. This is a technique that Ken and Brad mastered while annihilating fellow humans. But it was tough to beat Watson to the buzz. However, the humans enjoyed other advantages. English comes naturally to them. They didn't have to parse every sentence, going for a mad hunt to figure out what they were supposed to be looking for. During one of countless discussions leading up to the match, IBM scientists told Jeopardy execs that if they wanted a "level playing field," the humans should have to field a at least a few clues in Watson's native "language" of ones and zeros. Watson has a vast database and nearly instant recall of facts and figures. But it doesn't "know" or understand any of this information. It can only calculate its responses through statistical correlations. That's a sizeable handicap. It also has no life experience and no body, not to mention a sense of humor. In short, there's no way to make the match truly fair and even. It's impossible to add strengths to each side. So the only way to do it would be to impose handicaps. Yes, they could slow down Watson's finger. But could they handicap the humans to take away some of their unfair proficiency in language? I don't think that would be much fun. You could argue that Watson wouldn't have won without the fast buzzer, and I'm sure it's true. But then again, five years ago, a fast buzzer wouldn't have made any difference, because no machine on earth could discipher Jeopardy clues, hunt down facts, formulate answers and calculate its confidence in them within three seconds. A fast buzzer only mattered because Watson, after four years of research, was finally coming up with lots of correct answers. The value of the match, from my perspective, was that it showed the world just how far this type of question-answering machine has come--while also giving us a glimpse of its vulnerabilities. Had a nice 1/2 hour chat with Sheila English last night on Readers Entertainment Radio. Here's the link if you feel like listening. I spent more time than usual talking about a few of the challenges machines like Watson present. How do we change the school curriculum, for example, once machines are handling much of the fact-finding and question-answering work? The key, most people agree, is to push toward more critical thinking, communications, social awareness--all the things Watson cannot do. But how do you develop standards around that? It's something I've been thinking about. 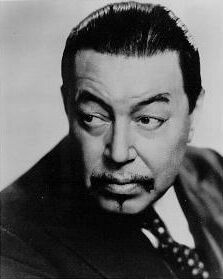 Charlie Chan, the fictional Chinese detective played in the movies by a Swedish actor, was known for his aphorisms. I found a page of them today. At first wondered if Watson would make sense of them. (Likely answer: a few) Then it occurred to me that Watson and the rest of us could benefit from a dose of Chan's ancient wisdom.